When I bought the salmon for yesterday’s dinner, I had the option of buying just enough for one meal at a rather high price, or picking up a club pack that would make two meals for only a dollar or two more. Bulk discounts are a really big thing here and, if you can work with it, can save you an awful lot of money. Owning a deep freeze is a great way to buy in bulk without having to eat the same thing for a week. However, most ocean fish that gets to us here is frozen, since we’re about 1,100km away from the Atlantic coast in our country, and 500km away if we drive south to the States. I didn’t want to re-freeze the extra salmon, so we ended up eating it two days in a row. I’d been itching to try out some of the recipes from my new-to-me copy of Jamie’s 15 Minute Meals (Jamie Oliver, 2012), and the green tea salmon with coconut rice & miso greens on page 138 looked like it was packed with flavour. I like how this book gives very specific directions for how to prepare these dishes in the least amount of time. That being said, this dish definitely took more than 15 minutes, mostly because of the rice. The instructions call for basmati rice to cook in light coconut milk for only 10 minutes — but I have never managed to make decent basmati on the stove in less than 25, and I cook it a lot. I tried to shave off a little time by cooking it in the Instant Pot (which didn’t exist when this book was written), but with the preheating, a 12-minute automatic cook time, and 10 minutes of releasing pressure naturally, it was still closer to a 25-minute cooking time. So I had to time my other preparation around the rice so that all of the elements finished at the same time. That actually made things much easier for me, since I’m definitely slower at my knife-work than Jamie. My other issue with this recipe, and it’s become a big of a pet peeveas I’ve written before, is that the ingredients aren’t measured by something objective like volume or weight. Rather, they were given such measurements as “bunches” or “thumb-sized”. It’s fine to be able to throw in a pinch of this and a dash of that once I know a recipe well, but when I’m trying it for the first time I want it to be as much like the original as possible. Also, a “bunch” can change size from store to store and season to season — and I’m pretty sure that we use slightly different varieties of veggies than over in the UK, so their sizes can vary considerably. This can throw off proportions and potentially ruin a recipe. In this recipe, I threw in a whole bunch of cilantro instead of half a bunch, because the bunches where I was shopping seemed really small. Also, I had to use broccoli instead of broccolini, since my local grocery store didn’t carry the latter at all; luckily that particular bunch also had an approximate weight measurement as well. Despite my pickiness about the recipe, I was very happy with the final dishes. 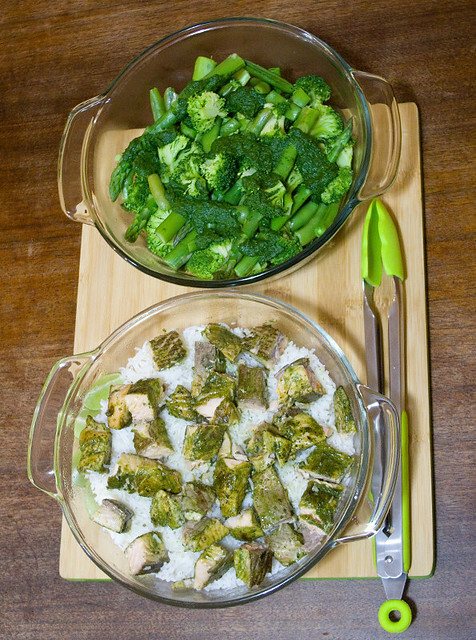 The salmon with its green tea coating was surprisingly delicious, the coconut rice was lovely (and so easy! ), and the veggies were crisp and fresh-tasting. I think the dressing would have been better with a little olive oil added to thin it out, since it had such a strong flavour that you really didn’t need much. The oil probably would have made my poor old blender deal with the whole thing better too, since it didn’t like working with such small quantities or low levels of liquid (my blender is older than I am). I think that making this sauce into a salad dressing for fresh greens would be absolutely lovely — unless I’m making it for someone who finds that cilantro tastes like soap. Luckily, I’m not one of them!